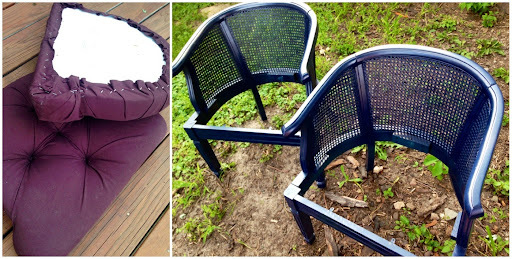 Yep I admit it, I made these poor chairs look pretty fugly with that purple fabric and I should have just left the wood as is. So stupid, ugh! 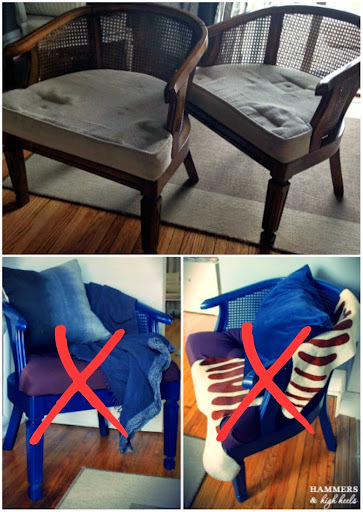 I guess I can't say it was a total mistake though- The one good thing that came out of it was that I learned how to tuft a seat cushion, something I've never done before! So it's kind of a bummer that I have to tear it all apart but in the end this look just ain't gonna fly anywhere in this house! Time to get to work! What color or wood stain for the chair frame? What type of fabric & color for the seat cushion? More to come on these AND the sunroom soon! See you then! A DIY Look That Feels Right At Last! A Darker Side of the Sunroom? !